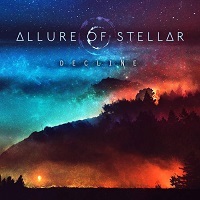 ALLURE OF STELLAR is an instrumental Progressive Metal project from Glasgow, Scotland. “Decline” is Jerome’s second EP, released January 16, 2019, and contains give tracks. “About to Burn” is a brief one-minute opener, with light strings dancing, ushering in heavy guitars that segue into “The Onslaught.” The mood is dark and the very ground beneath you shakes from the heaviness of the guitars. Bass notes hold down the low end as lead guitars work in and around them. It’s a brutal and punishing sound, but not without Progressive melodies, and an overall sense of grandiosity. Layers build until around the half-way mark, then the song continues with just the solitary lead guitar notes heard earlier in the mix, with the thudding of bass. It crescendos through the end of the song, with crashing cymbals and enough weight to pull your feel out from under you. “Odium Continuum” is close to seven minutes in length. Opening slowly and cautiously, with gentle, weeping lead guitar notes and the steady pulse of bass guitar. The lead guitar builds into a wonderful frenzied melody and then it’s back to that solemn sound. A staccato attack then forms around the half-way point, using the same melodies but in a different manner, with support from keyboards. The thing Jerome does so well hers is build that melody and expand it along the way. “Wistful Times” opens with a funky keyboard melody, and subdued lead guitars in a gentle breeze. The tone is once again thoughtful and solemn, in a more simplistic way. It gives you pause for reflection and brings forth feelings of longing, as the title suggests. The orchestral arrangements are there but fit perfectly in the background. “Nothing but Embers” is a short two-and-a-half minute closer. Following some opening bombast, he settles down into a little groove and then the heaviness descends on you like a threatening grey thundercloud, unleashing and then leaving you clean at the end. EPs are always a bit if a crap shoot for me. In some cases, there is just enough music for you to form a solid impression, but in other cases you are wanting to hear more. I think what Jerome has done here shows a very solid impression of the type of artist that he is. Meticulously crafted, “Decline” shows a wide variety of skills in both his songwriting and in his performance. Heavy and crushing bass lines at times, with melodies that shine brightly at others, all with Symphonic elements that smartly don’t take over, this is an outstanding album to listen to.